News flash – Bugaboo Donkey – double pram of your dreams! Breaking news – this is the Bugaboo double we’ve all been waiting for! Though dubbed the Bugaboo Donkey, it’s anything but beastly and we’re told it’s due for release from our autumn next year – though we’ll probably see it a bit later than that. With breaking news this hot, the web is abuzz with excitement. I remember parents bemoaning the lack of a Bug double back in 2005 when I had my first son so now broken hearts can be soothed with the news of the Donkey. Here’s the info from the press release! increased storage space and the option to convert from a mono to a side by side duo stroller for parents with two young children or twins. The greatly increased storage space – an expandable side luggage basket and under-seat basket – allows parents to carry all the goods they may need whilst on the go. The Bugaboo Donkey can be expanded and downsized again in only three clicks. In mono configuration the Bugaboo Donkey is 60 cm wide, which is the same width as the Bugaboo Cameleon. In duo configuration, with only 74 cm it’s the narrowest (luxury) side by side duo stroller. 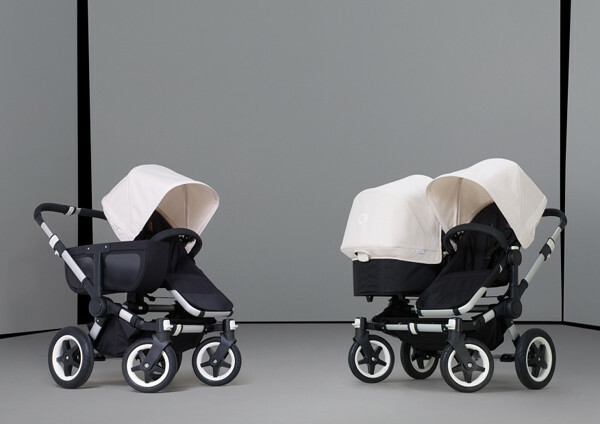 The Bugaboo Donkey will be available during the Spring of 2011 in the USA, UK, Netherlands and Spain. We expect further roll out in other countries later that year. The Bugaboo Donkey is the latest addition to Bugaboo’s portfolio which further includes the Bugaboo Frog, the Bugaboo Bee, and the Bugaboo Cameleon. We’re loving the extra storage space on the Donkey above left. This beauty is being launched at the Kind + Jugend trade show tomorrow so hang about for more information. I’m all flushed in the cheeks over this exciting news! We’ve been treated to two videos about the Donkey, so watch and enjoy. Update – Now you can read our full Bugaboo Donkey review.